I have released The Concert. Brad and Kris go to Phoenix to visit Brad’s grandparents and to see a concert put on by Cliff and The Cowboys. Brad’s grandparents don’t know he’s gay, so they have to play “just friends” again. However, Cliff has a problem with a radio reporter and accidentally “drags Brad out of the closet.” Will Brad leave Kris just because his grandparents don’t approve? 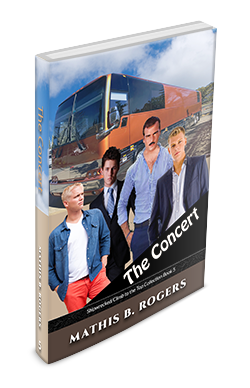 You may get your copy of The Concert here. I will be releasing The Cruise next week.